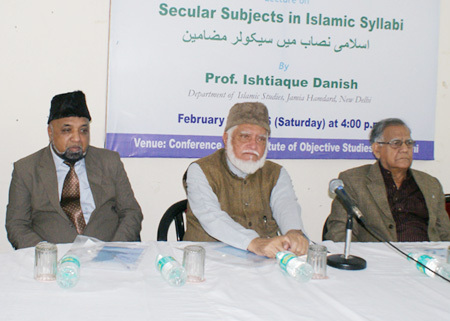 The Institute of Objective Studies organised a lecture on “Secular Subjects in Islamic Syllabi” on February 20, 2016 at its conference hall. 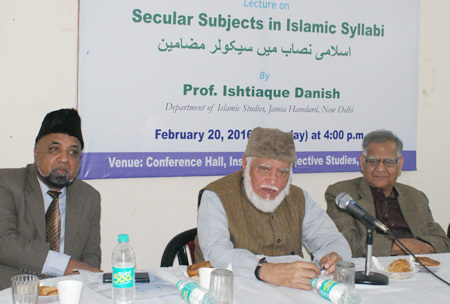 Delivering the lecture, Prof. Ishtiaque Danish, Department of Islamic Studies, Jamia Hamdard, New Delhi, held that Islamic and modern education were not two different things in the early years of Islam. Mathematics and physics were part of the curriculum as the ordination in respect of Allah’s will had come through the Prophet (PBUH) which could not have been understood without mathematics. This perhaps was the reason why at the Suffa, in Masjid-i-Nabwi and nine other mosques, the teaching of mathematics and astronomy was included in the syllabus. As the teachings of the Prophet Muhamamd (PBUH) did not distinguish between Islamic and secular subjects, the question of separation of two subjects did not arise, he said. He insisted that Britain was believed to have distinguished between the two streams, but the moot question which still remained enigmatic was how knowledge found way into that country from Arabians. Prof. Danish explained that during the Dark Ages, between the 8th and 10th centuries A.D., there was no concept of teaching in Europe. However, for the Muslim world, this was the most glorious period as far as pursuit of knowledge was concerned. This continued till the eleventh century. The Renaissance in Europe from 13th century onward saw the decline of the Islamic world. This was the time when the church used to send its followers to countries like Spain and Egypt at its own expense to see what subjects Muslims were studying. During the Crusade, which followed the European Dark Ages, pontiffs even dispatched rogues, to fight against Muslims on the promise that they would be pardoned and a certificate for entry into heaven issued to them. This policy was opposed by enlightened sections among the Christians and a debate on the role of the church intensified, leading to the belief that the role of the church was confined to religious affairs. They believed that the responsibility to run the government rested with intellectuals and experts. This resulted in the separation of the state and the church, he maintained. Enlightenment witnessed the rise in the demand for reforms within the church and intellectuals were in the forefront of it. They used to say that the situation created by the church had converted the world into a living hell. He noted that Christians continued to let loose a reign of terror till the beginning of the World War I.
Prof. Danish opined that the Roman Empire created the basic structure of land use and agriculture while the Muslims strengthened this structure and brought an end to oppression and victimisation. But the Industrial Revolution divided society because as against agriculture, which was village-centric, it spread to the towns and big cities. Though it generated a lot of money, its distribution was uneven. He said that the period saw the development of shipping as by that time steam engines were used to propel ships instead of mast. It was believed that the Roman navy was the strongest at that time. One development that also marked the 19th and 20th centuries was that 98 percent Europeans turned non-religious and called themselves “humanists”. He observed that Europe invented rail, motor and electricity during the period, but Muslims trailed behind. The Industrial Revolution reached Germany, leaving France and Britain behind, though both the countries had several colonies under their control. This led to a fight between them. Commenting on the situation that obtained during the period, he said that the church committed the same follies as our ulema did in rejecting everything. While English was being used as a means of communication in the colonies under British occupation, a group of Englishmen opposed the move to impart English education to Indians. They pleaded that Britain lost America after teaching them English and the same fate was awaiting them in India, he pointed out. Referring to Imam Ghazali, he said that separation of secular knowledge from Islamic learning was attributed to him. He termed it as a mistake to separate them from each other. Imam Ghazali declared the study of medical science as preferential (farz-i-kifaya) but was against astrology. As the research showed, science would not have touched new heights but for the contribution of Muslims at an early stage. During the glorious period of Muslims also, there was no division between different branches of knowledge. That was the reason why leading scholars of Hadith (muhaddisin) were scientists as well. 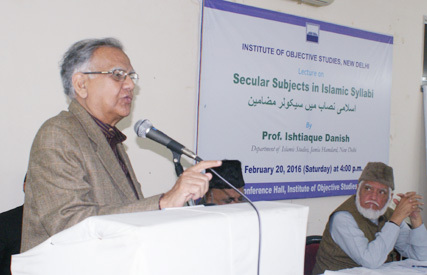 Prof. Danish commented that during the Mughal rule, when madarsas (religious seminaries) and logic were established, courses on the Quran, Hadith, Fiqh (Islamic jurisprudence) were introduced. Later on Ilm-ul-Kalam (Scholastics) was also introduced as one of subjects. He said that during the Ottoman Empire, Safavid Empire and Mughal Empire, knowledge used to be a unit and subjects of study were prescribed. During the Mughals, books written by Mulla Nizamuddin Sahalvi were prescribed for madarsas, but during the reign of Aurangzeb, books were not prescribed. Instead, only subjects to be taught were decided and it was left to the teacher to select books. He argued that these subjects continued to be taught until the British firmed up their position in India. This syllabus laid more stress on logic than science. This was the main feature of the curriculum during all the three empires, he added. In his presidential address, former professor of Arabic, Prof. Mohsin Usmani held that knowledge was indivisible. It was perfect in itself. Whatever Allah taught Hazrat Adam, was the beginning of science. Allah wanted to create a temporal power to carry out His commands. He regretted that despite vast resources, Arab world did not pay attention to the acquisition of scientific and technological knowledge, which was needed most today. 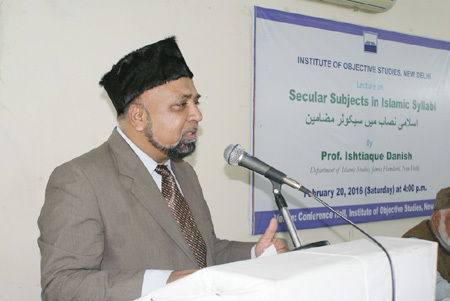 The Secretary General of the IOS, Prof. ZM Khan opined that the spirit of Islam lay in faith (Imaan) and good deeds. And both of them could not be attained without knowledge. He informed that IOS was making efforts to create an Islamic world view. Earlier, the lecture began with the recital of a Quranic verse by Hafiz Athar Husain Nadwi. 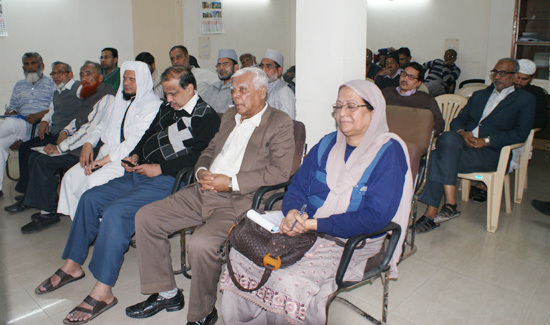 While Dr. Nakhat Husain Nadwi conducted the proceedings, a good numbers of Islamic scholars, university teachers, students, social activists and prominent citizens, including Prof. Hasina Hashia, Inamullah, W. Ahmed Chauhan, Shahabuddin Ansari, Syed Mohsin, Ali Kirmani, Ahmad Nadir Qasmi, S. Haja, Nasir Ahmad, Shafique Aslam, Javed Akhtar, Md Firdous, Sheikh Nizamuddin and Safi Akhtar attended the lecture.